Lately I've been OBSESSED with avocado. I mean, I always hold avocado in a place close to my heart (or stomach), but lately, it's like my BFF. 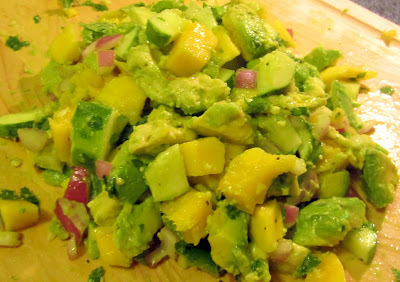 I put it in or on everything...salads, sandwiches, mixed with black beans and a little lime juice for a quick side dish, and of course, guacamole - I.Love.Avocado. and I don't care who knows it! 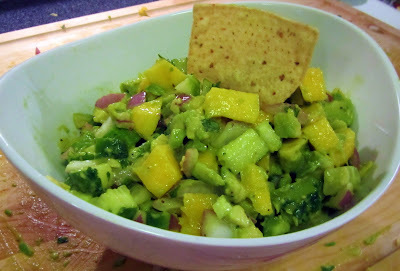 So when I found this mango salsa recipe online, I knew the only thing that could make it complete would be my beloved avocado...and lots of it! 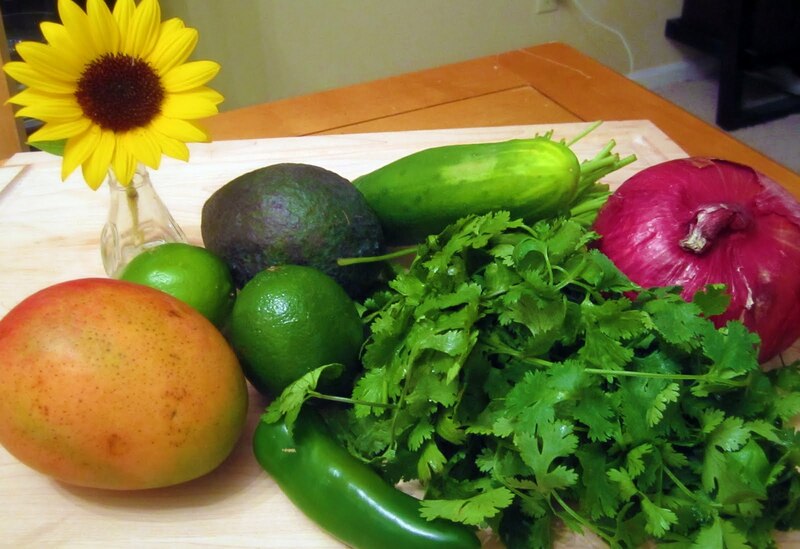 This salsa would be perfect on top of fish or chicken too! 1) Peel your mango - I hate peeling things. Call me lazy, but I'm just not a fan. But alas, this salsa is worth it. To know when a mango is ripe, make sure it gives a little when you press it but you don't want it mushy. Thanks super nice Harris Teeter produce guy for the tip! 2) Avocado - Unlike my guacamole where I like my avocado to be soft and totally mash-able, for a salsa I like my avocado to be a bit firm so it dices nicely. I also add a LOT of avocado to this, the more the better...but you don't have to! 3) Jalapeno - You don't have to use this if you are scared of the spice (ahem, Mr. Fo), but I find that if I remove all the seeds and chop up the pepper it adds the perfect amount of spice! 4) Mini Sunflower pictured below - don't include people...it's for decoration ONLY! 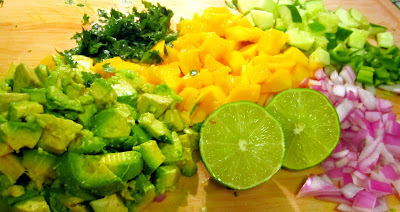 Mix all ingredients together with lime juice and salt and pepper. Keep adding and tasting until it's perfect! Dip with your favorite chip - I like Lime Tostitos, but regular works too! Instructions: Mix together and enjoy! Let flavors blend together in the fridge for a few hours if possible. Bring this to your next BBQ and you will be a star, I PROMISE! oh my gosh, that looks soooo good! i love making salsa... spicy peach is my fave, but that looks awesome! Mmmmm! This just looks delicious! Now I want to go to the store and get some avocado!